Powers/Abilities: Tangle has the ability to generate high-tensile organic filaments from her fingertips to ensnare targets. If the filaments are severed, it causes her enough pain to blackout. 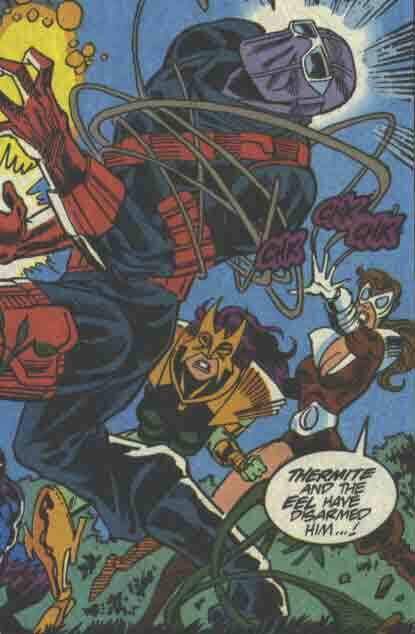 History: (Web of Spider-Man#100 (fb) - BTS) - Tangle received her powers from the New Enforcers' power-enhancement treatments so that she could serve on their team. (Web of Spider-Man#100) - When the Blood Rose broke on to the grounds of the New Enforcers' base, the Vanisher teleported Tangle, Thermite, Plantman, Eel and Blitz to confront him. Tangle snared Blood Rose with her filaments, but before the other Enforcers could deal with him, Spider-Man arrived on the scene, wearing special armor designed for the battle. Thermite and Tangle boasted that he was unprepared to deal with them because they were new adversaries, but Spider-Man simply observed they were both amateurs, and hit Tangle in the face with a web-club. When she revived, Tangle wound her filaments around Spider-Man, but he grabbed the filaments and snapped them from her fingertips, causing her to fall unconscious. Spider-Man later turned her over to the police. Comments: Created by Terry Kavanagh, Alex Saviuk and Joe Rubinstein. Official Handbook of the Marvel Universe A-Z Hardcover#4. Real name revealed in Enforcers profile.